Korea’s BLACKPINK is all-in with their 2019 US media blitz…how will the public react? Before an all-female studio audience in ITV’s An Audience With…The Spice Girls music special, the five figures of 1990s pop star girl power sang to and mingled with their heavily marketed demographic: the young girl learning to become a woman. Ginger Spice: And we feel it’s about time that girls come first for a change! Girl groups exist in a unique cultural space. On the surface, their fan bases appear the same as boy bands: a majority of young girls screaming, interspersed with a few boys and slightly larger ratio of parents who drove everybody to the concert. From the Western perspective, it’s a bankable formula the Herberts, Lou Pearlman, Maurice Starr and Simon Cowell knew all too well. But where the boy band’s show is presumably charged up with hormone-fueled cheers, the girl group’s show is charged up with….what? Behind the girl group perfect image and the polished pop hits, there is obviously something meaningful…so who’s answering that call in 2019? Debuting their first music video “BOOMBAYAH” with a catchy war cry (and a global strategy), BLACKPINK is Korea’s latest export to make a serious run at the long-desired and formerly impenetrable US market. We last visited K-pop in December 2017 when boy band BTS was wrapping up a media blitz stateside, hitting high-profile radio and TV shows like Ryan Seacrest, Ellen, Jimmy Kimmel, and James Corden, spiked with an American Music Awards performance of their hit “DNA” (currently at 660M YouTube views). For many, BTS’ repeated successes in the States confirmed a more serious arrival for K-pop, one that had finally moved past its wildly popular but novelty-driven “Gangnam Style” inflection point. January 2019 opened up strong for BLACKPINK, announcing their two Friday topline performances at Coachella, live entertainment company AEG/Goldenvoice’s flagship music festival. The coordinated PR push was strong, with Time, Hollywood Reporter, Forbes, Rolling Stone and Billboardall releasing their own versions of the news between Jan 3rd and 4th. February saw an exclusive collaboration with Billboard Magazine, releasing a bevy of “get to know us” content online and in print with their 5-cover box set. The Billboard campaign seems virtually identical to BTS’ only a year prior, so much so that the current BLACKPINK box set is actually at the same URL that BTS’ presumably was at (https://shop.billboard.com/collections/bts-box-set). BLACKPINK also made their US television debut in February 2019 on the Late Show with Stephen Colbert, and announced their six-city North American tour dates on the ABC network’s Good Morning America show, performing in NYC’s Times Square. This news was also posted on BLACKPINK’s 16M+ follower Instagram account, the 2nd most followed music group account on the platform, barely behind UK’s currently-defunct One Direction at 17M. This is all great news for BLINKs, BLACKPINK’s fandom…but after all the high-level, strategic moves…what does the group’s traction look like on the ground? BLACKPINK, Little Mix & Fifth Harmony Audiences: What’s Unique? 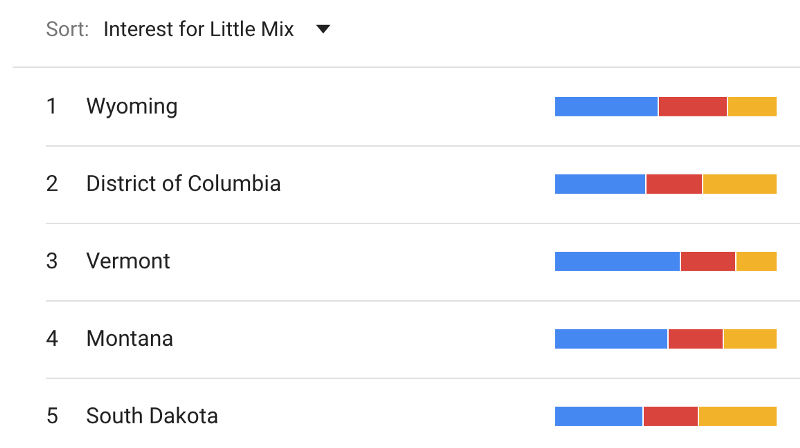 Similar to how we juxtaposed BTS’ music data in Dec 2017 with the last great boy band, One Direction, we’ll do the same with BLACKPINK, but this time with two of the last great girl groups, the UK’s Little Mix and America’s Fifth Harmony. We have the benefit of two groups to juxtapose BLACKPINK with, and they each come with their relative strengths and weaknesses. Fifth Harmony tends to have bigger reach (e.g., more Spotify followers/YouTube subscribers), while Little Mix tends to have better engagement (e.g., more Spotify monthly listeners/YouTube views). This is certainly a factor of Little Mix still working proactively in 2019, while Fifth Harmony member Camila Cabello left for her solo career in 2016 and the group subsequently going into a hiatus in 2018. All of the girl and boy groups have similar but unique heritage as well. Interestingly, Little Mix, Fifth Harmony & One Direction all originated from the X-Factor talent show and the Simon Cowell-owned, Sony-distributed Syco Music. Two of those groups suffered a member-loss/hiatus. On the Korean side, BTS’ home agency (the Korean music label is more of a vertically-integrated entity) is the independent BigHit Entertainment, while BLACKPINK’s is YG Entertainment, one of the three major publicly-traded Korean agencies that’s released K-pop titan acts Big Bang and 2NE1. While both BLACKPINK and BTS formed in the traditional years-long audition/training incubation period common in the business (K-pop is unabashedly considered “cultural technology”), BigHit has had roughly a decade less experience and fewer hit acts than YG, but they also hold all the cards in 2019…well, just seven really: BTS. Keeping this in mind, let’s take a look at BLACKPINK’s data. Instagram Follower Demographics: What Insights Can Be Extracted? Since Instagram (IG) is currently the most influential music industry social media platform, let’s use each group’s IG follower data to understand both group’s audiences a little bit better. Our data source is as of Feb 2019, from social influencer data company Deep Social. Note: Average likes/views/comments are over the last 30 posts, and engagement rate denotes the average likes / total followers. With zero doubt, one look at the key performance indicators on this platform has BLACKPINK dominating in virtually every category. While this data has been captured in the midst of their aforementioned huge publicity cycle, it’s not to take away from their achievements. With One Direction being in hiatus, BLACKPINK is the #1 music group active today on Instagram. Full stop. Opposite of what we see in the other two groups’ streaming data, Little Mix shows more reach (11M followers) and less engagement (1.82%), while Fifth Harmony shows significantly higher average statistics. This may seem counterintuitive, but it makes sense if Fifth Harmony hasn’t posted since May 2018, and yet their old posts are still compiling current “we miss you” likes/views/comments today. In this way, Little Mix’s statistics suffer a penalty for actually being active, but this is a small price to pay as Little Mix’s current streaming numbers (17.7M Spotify monthly listeners / 4.8M YouTube daily views) far outweigh Fifth Harmony’s (9.1M Spotify monthly listeners / 2.3M YouTube daily views). Taking a look at where all of the Instagram followers are located starts to paint a more detailed picture, and one that isn’t necessarily to BLACKPINK’s advantage in light of their current Western goals. Little Mix and Fifth Harmony’s distribution is similar: both well-distributed globally. For their Top 10 countries, Little Mix has three LatAm, three European and three Asian countries plus the US. Fifth Harmony has four LatAm, two European and three Asian countries plus the US. Both groups show strong followings in both the Brazil (#1) and the US (#2) markets. BLACKPINK, however, has eight Asian countries plus Brazil and the US in their top 10 countries. Indonesia is their #1 at 26% of their IG following, with the US at #4 (6%) and Brazil at #7 (4.5%). Without getting too heavy, this is the cultural burden that BLACKPINK, YG Entertainment, and any Eastern act faces in 2019. It’s simply a fact of globalization that Western economic and cultural power has mostly flowed from the West to the East in recent history, and not vice versa. Or in simpler terms, there is no shortage of McDonald’s locations (there’s 450 in Korea) or theaters showing Hollywood movies in Asia. But the reverse? We’re simply not there yet. Even on Instagram, where social media allows any fan to like any musical act they want in the world…BLACKPINK faces an uphill path they must weather through. Taking a look at age and gender, BLACKPINK is definitely showing some Spice Girls-style influence. Of the three groups, they lead with highest proportion of female IG followers at 81% (12.8M). All three groups heavily skew under 25 years old, though BLACKPINK shows a more even female split between early Gen Z (13–17 years old) and later Gen Z (18–24), at 32% and 35%, respectively. This more even distribution would make sense given BLACKPINK’s 2016 start as a group, several years behind Little Mix (2011) and Fifth Harmony (2012). The respective fan bases of the latter two groups are getting older, with Little Mix still active (released last album LM5 Nov 2018) but not promoting as hard, and Fifth Harmony falling silent last year. BLACKPINK’s more recent musical output and promotional activity takes advantage of this, which shows in the data. With group origins based in traditionally Anglo-centric territories, Little Mix (61%) and Fifth Harmony (57%) both resonate most with White/Caucasian followers. With BLACKPINK’s origin in Korea, it would be expected that their IG following is mostly Asian (58%). What is interesting is all three groups show a considerable (>20%) dropoff to the next ethnicity, despite all groups having multi-cultural backgrounds, and all three groups showing a clear English preference among the IG followers, the most widely spread lingua-franca of the world. For example, Little Mix’s Leigh-Anne Pinnock, as the group’s only African-American member, always “felt invisible” and as if she had less fans than her peers. Only 10% of Little Mix’s IG followers are estimated to be African-American. Or if you went by Fifth Harmony’s members cultural backgrounds, they actually would be considered a Latinx/Oceanic act: Dinah Jane is of Tongan descent, while Lauren Jauregui has roots in Cuba, Ally Brooke Hernandez Mexico and ex-member Camila Cabello from both countries. Their Hispanic IG following is estimated at only 23%. In Billboard’s cover story with BLACKPINK, they describe their “multinational identity” (Korean, Thai, Australian, New Zealander) as having “global appeal”, which is a fair statement. But when it comes to American race politics– an environment unparalleled in complexity and certainly nothing any Asian act is used to- it begs a consideration of race vs. ethnicity, and how that will affect their traction in America. Though from different countries, all BLACKPINK members have an Asian phenotype, or racial appearance. In a country with an Asian population under 6% (as of US Census 2017), is there enough of an appreciation between Asian appearances to give them such an appeal in the US? Hopefully. But given BTS’s not so far off experience of American race politics during their 2017 Billboard award for Top Social Artist, it’s something BLINKs (and humanity) hope the country can move past. We’ve considered Wikipedia to be a great source to sample the public’s curiosity for an artist, as it’s an active Internet search to seek out not entertainment (e.g., streaming or social media posting), but static information. Where is an artist from? What are their backgrounds? What are their names? For BLACKPINK, they definitely experienced a “curiosity bump” in Oct 2018, after their WMG-released single “Kiss and Make Up” with Grammy-winning British artist, Dua Lipa. A reggaeton-flavored, sassy tune that is easily danceable and Top 40-friendly, the official YouTube audio recently broke the 98M view mark, with comments yearning for an official video, which has yet to be released. Despite the great reception, BLACKPINK’s Wikipedia page only experienced a peak increase to 8.8K views/day, with their week average before the date hovering around 5K views/day. The track- despite reaching the Spotify Global Viral 50 in November 2018 and living on Today’s Top Hits for three months- never got the promotional push evident in a label priority record, obviously evident in its lack of a fully-produced music video and getting relatively little US radio play. BLACKPINK’s recent Billboard exclusive (Feb 28) may be behind their 10x increase in Wikipedia views in March 2019, and it remains to be seen how much that curiosity increase endures as the month goes on. 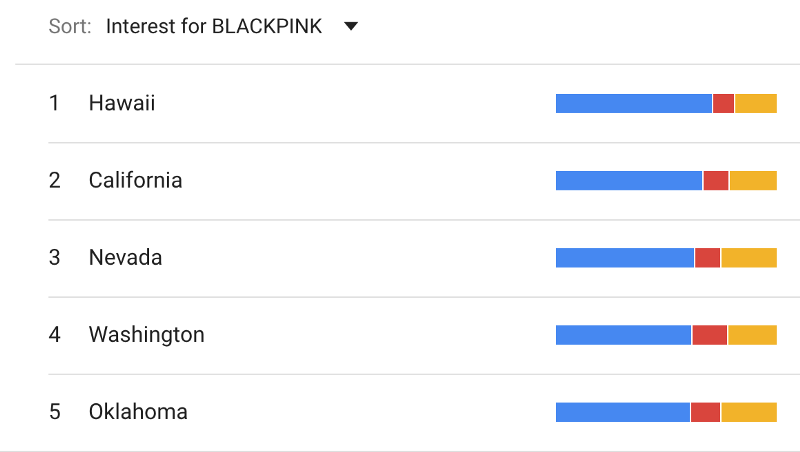 Google Trends for the three girl groups: BLACKPINK’s in the area. Google Trends continues to be an interesting way to measure curiosity as well, like we visited in Aug 2018 with XXXTentacion and other “emo rap” artists. The graph above measures on a normalized (0–100) index the relative amount of searches for that particular search term over time. Over the past 12 months, the overall trend of Americans searching for BLACKPINK (blue trend line) on Google definitely shows a curiosity bump coinciding with the Billboard release in Feb 2019, with Fifth Harmony (orange trend line) showing occasional interest and Little Mix (red trend line) with the least. This bodes well for BLACKPINK. However, an interesting US-domestic trend reveals itself when drilling down to the state-level. BLACKPINK’s most interested states gravitate to the West Coast, where ~45% of the US Asian population lives in. For the other two groups, they most resonate in the American heartland (e.g., Wyoming, Montana, North/South Dakota) as well as the East Coast (e.g., Washington DC, Vermont, New Hampshire). 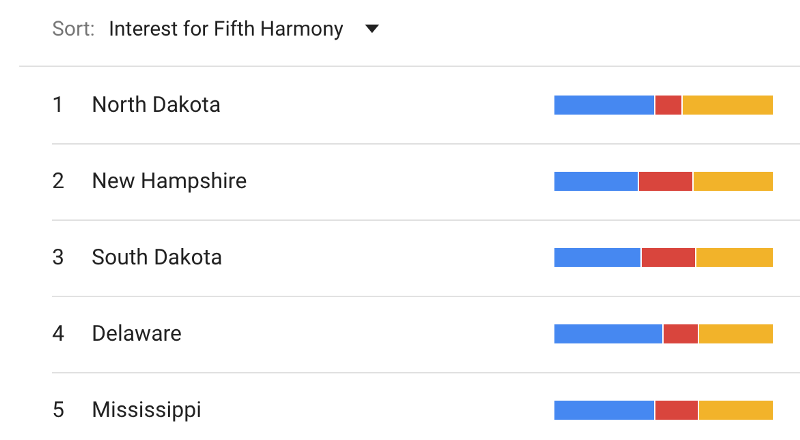 What’s good here for BLACKPINK is that their search frequency is neck-and-neck, if not overtaking both girl groups in all of those Midwest and East Coast states. But the West Coast pull is definitely evident and something to be aware of as they continue their American strategy. Though their data is very encouraging, BLACKPINK certainly has their work cut out for them. The Fader’s Sasha Geffen makes a nuanced argument about the underlying draw to the girl group concept, citing not only the Spice Girls but also TLC and Destiny’s Child that were active through the 2000s. She argues that despite all their commercial successes and cultural impact, somehow Western fans care more now to the lone warrior Wonder Woman image, rather than a group showing similar strength. Geffen also comments on the gender imbalance when it comes to girl group fandoms- while it’s socially accepted for girls to simultaneously form identity from and also be infatuated with their boy band members, straight boys are only safe to be infatuated with girl group members, but not form identity from them. This is certainly clear in the overwhelmingly female Instagram gender statistics. A Twitter fan’s hopes for a BLACKPINK/Little Mix collaboration. Additionally, Billboard’s Kate Solomon brings into play a Western media landscape that “historically pitted women artists against each other and jumped on any whiff of conflict”, and so Solomon advocates for a more fluid, “collective” approach to the modern girl group. Citing a Dua Lipa, Charli XCX, ALMA, MØ and Zara Larsson BBC Studio 1 Live Lounge performance as the most exciting group of girls performing in 2018, Solomon envisions a girl group that can release music individually and as a group at will. Essentially, a “solo-as-hub” career focus, with occasional dalliances in a group setting. Interestingly, K-pop has long had the opposite: a “group-as-hub” release strategy in which the group is the priority. In K-pop, solo careers can not only run in parallel, but they strengthen the group’s brand through each individual’s unique flavor outside of the group. Big Bang, the last great K-pop boy band also from YG Entertainment, largely grew from their amazing group music videos, supplemented with equallyslick solo/duo ventures. No drama involved. BLACKPINK’s Jennie has already released a solo single in Nov 2018 to the tune of 235M YouTube views, with the other members slated to release solo material later on. Given all these factors in America, it will be fascinating to see how fans will react to the Korean “group-as-hub” model, when recent history has trained them to see such a release strategy as a break-up predictor (at least in the girl/boy group sector). Then again, it’s not like we haven’t seen it before in the wider American music industry. All in all, the numbers seem to show that BLACKPINK is well-poised to make an impact in the Western world, but their saving grace may be something much more special and subjective. Something at that deep, personal level former Spice Girls fans reminisced about at the top of this article. Hope you enjoyed our latest look into BLACKPINK’s mission and the current state of girl groups. If you’re interested in checking out some of this music data yourself, you’ve got afree account waiting for you here.Thanks to Sung Cho.